A few years ago, Samsung focused on high-tiered phone models like the Galaxy S and Note series. However, I noticed they didn’t care much at their entry and mid-range phones. So I was actually glad that they released their J series, starting with the Samsung J5 which became in demand two years ago. 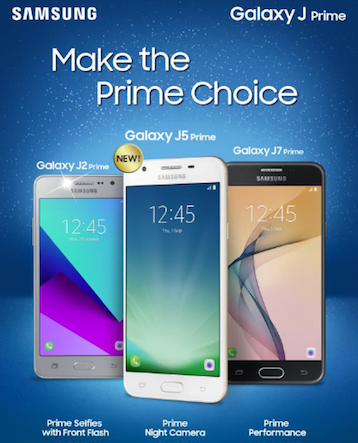 Samsung has released two other J models, the J2 and the J7 since then. I have a J5 which I recently gave to my dad and a J7 (a 2016 version I think) which we will post a review anytime soon. These phone models were updated and given prime features, hence naming it as the Samsung Galaxy J Prime series. The Samsung Galaxy J2 Prime was launched locally a couple of months back with Liza Soberano as its celebrity endorser. Its reliable 8 Megapixel camera and front-flash are its main features and at the same time a potential threat to local brands like Cherry Mobile thanks to its friendly price. SRP is P5,990. Watch out for our review soon. The Samsung Galaxy J5 Prime is the latest addition in the J Prime series and it’s geared towards smartphone users who like to take pictures at night. The rear camera is equipped with a 13 Megapixel camera with an aperture of f/1.9 which can let you take photos in low light conditions. This should be useful if you want to take photos of your nightlife activities. Performance is better thanks to its Exynos processor, an internal storage of 16GB and 2GB of RAM. SRP of the Galaxy J5 Prime is P9,990. Lastly, the Samsung Galaxy J7 Prime offers a prime performance starting with a spacious internal storage of 32GB and 3GB of RAM. Screen display supports Full HD and packs 3,300 mAh of battery juice. Its design looks sophisticated whether in black or gold colors. SRP is P12,1990. If you would like to see the Samsung Galaxy J Prime phones in the flesh, check them out at the Samsung Experience Stores or authorized dealers nearest you.